Muay Thai, known as Thai Boxing or the Art of Eight Limbs, is a sport that is rapidly growing in the United States, especially among women. There is a multitude of reasons for why this is, ranging from the desire to learn self-defense to admiration of Mixed Martial Artists to the empowerment one feels at the end of every session. For every newfound-obsession, research usually follows. With this accumulation of knowledge, you begin to find the athletes that you most admire and look up to. Tennis players look up to Serena Williams and Andre Agassi, basketball players idolize Kobe Bryant or Candace Parker, and for the longest time the most recognizable names in Muay Thai were Buakaw, Saenchai, or even John Wayne Parr. Now however, when individuals such as myself look for well-known women in Muay Thai, one name continuously pops up: Sylvie von Duuglas-Ittu. 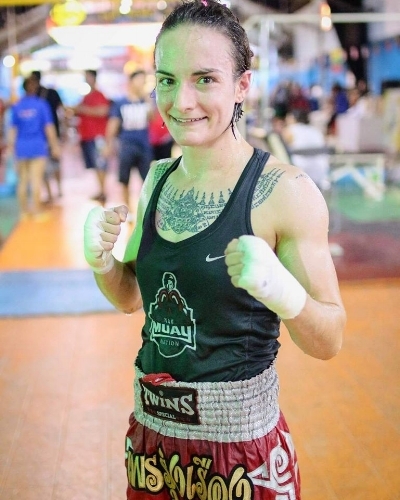 Sylvie is an American Muay Thai journalist who at this time of publishing, recently won her 171st fight in Thailand. She originally moved to the country with the intent of training for a year and accumulating about 50 bouts. Several years later, she is still training, writing, and focusing on obtaining 200 fights. 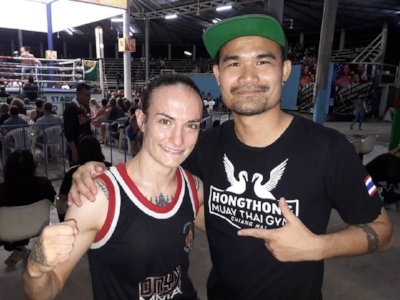 Already, von Duuglas-Ittu has the most fights of any female Muay Thai fighter (as well as the most fights of any foreigner, male or female), with an impressive host of belts. A documentary gives a brief behind-the-scenes on her fights, but even more remarkable is the sheer amount of content she produces and shares. Her website, YouTube channel, and social media is packed with videos of Thailand and Muay Thai techniques. von Duuglas-Ittu maintains a blog exhaustingly researched and detailed about her day-to-day life, musings, and observations that she has found since moving to Thailand. Sylvie estimates that at this extent, she must have written more about Muay Thai than any other single Western author. For many, as they learn and discover more about the sport, von Duuglas-Ittu's contribution has truly been a gift. Via her website, they are able to access anything from tips regarding technique to videos of her fights to a forum where visitors are encouraged to ask questions and share their experiences. It seems that every person that falls in love with the sport more than likely will come across von Duuglas-Ittu's vast work or knowledge in some way or form. All of this is not done without sacrifice, as Sylvie's work requires the aid supported by pledges from donors. A small gift of even $1-5 per month helps her site to continue running and gives her the ability to continue writing, sharing, and learning about the amazing art that is Muay Thai. What about Muay Thai intrigued you? You mentioned on your website you watched a lot of Kung Fu, but Muay Thai was what you became very interested in. Why do you feel that is? I had never watched a lot of Kung Fu growing up, although I had a steady intake of those Van Damme movies, which is mostly TaeKwonDo. I hate them now, other than the nostalgia element. The reason I was watching so much Kung Fu is that my husband is an avid fan and when I’d had enough he insisted I just see this one more because “you’ve never seen anything like it.” It was true. Muay Thai looks different from anything else and, indeed, the Muay Boran of the movie Ong Bak doesn’t look totally like ring Muay Thai. But I was in love at first sight. As a fighter with a huge collective following, what do you feel your responsibilities become as a journalist? My responsibility is to share as much as possible of what I see, experience, and to the extent to which I can understand cultural aspects of living, training, and fighting as a double outsider: a woman in a man’s sport and a westerner in Thailand. I try to be as honest as possible, not as authoritative as possible. In what ways does being a foreigner in Thailand help you see the culture? In what ways do you feel like it holds you back? There are things I simply don’t understand because I lack the appropriate context that someone raised in the culture might have. Instead, I have my own upbringing and I’m looking at something comparatively. This is also a gift because sometimes you can’t see something because you were raised with it--it becomes invisible because it simply is the way it is. When I lived in Berlin for about 8 months I noted to my roommate, who was German, that the word for “monument” in German is quite interesting, as it’s Denkmal, which literally breaks down to the command: “Hey, think about this.” My roommate never would have broken the word down like that, in the same way that native English speakers might not consider that an elevator elevates--that’s just what it’s called. There are things about living in a different culture that are easier to observe (and harder to deal with) for similar reasons. You've written about the pursuit of 100 fights, which has increased more, the longer that you've stayed. What about fighting empowers you? Everything about fighting empowers me. In the ring, with nothing but gloves on your hands, you are quite naked. There’s nowhere to hide, your flaws and strengths are all just right there in the open. Your opponent can make you look better than you are or worse than you are, but it’s in how you handle that exposure that really tells you who you are; then you go back to training to become who you want to be. I just want to fight as much as possible and the number is a target; it’s a moving target. Reaching for 50 (my original goal) seemed close enough to impossible that it was a great target to go after. When I reached that, 100 seemed a good number because nobody else had done it. Now I’m at 150+ and I’m reaching toward 200 because it changes what people think of as being possible; it changes the game. Training in Thailand is very different than the States, and your routine must be very different. Do you find that you have more focus or is it just an enjoyable experience? Hahaha, I’m not sure that 90% of what I do is “enjoyable.” It’s often very hard and I’m very hard on myself so it can be a struggle. But it’s meaningful and I have a lot of fun in training when I’m able to let myself be free, which is more and more frequent. The way I trained in the States is not how most people who learn Muay Thai train, as I didn’t have a gym--I just trained one-on-one lessons with Master K and hit a bag at home. But training outside of Thailand for most people is a handful of hours per week, after work, and between the responsibilities of life. In Thailand it’s 4-6 hours per day and it’s a way of life, so your responsibilities are focused in the gym. In the same way that having multiple fights takes the pressure off of any single performance, I think training so much and so consistantly like we do here in Thailand takes the impact out of any single session. You can have a good day and a bad day all in one day here. As a female competitor, what are some of the obstacles you face regularly? I’m treated differently from the boys and men I train with. There is great equality and understanding at my gym--and I do believe it’s increased because of my presence there, as I’ve changed the attitudes of my trainer and his family about what women are capable of or what drives us--but I consistently hit this same wall of inequality in that I will never be a Thai boy. The potential of a Thai boy in becoming a man is something totally unattainable for girls and women, and the way the culture and sport works right now, that’s a huge inequality. Why do you feel like it would be in a woman's benefit to learn Muay Thai or any martial art? Women benefit from confidence and challenge, both of which you can get from training Muay Thai. I think most women struggle with themselves as it is and training in a martial art gives you a way to channel and focus that struggle. It isn’t all positive all the time, but it is growth all the time. What is a project that you're interested in or currently working on that we should know about? I work in an “open shop,” so to speak. What I’m working on and interested in is always on the table through my writing and videos. I’m a big believer in the math teacher’s command that students “show your work.” So that’s what I do. But the thing I'm working on most is trying to make my writing and documentary video of 8limbs.us self-sustaining. I'm doing this through Patreon by creating special Supporter Only content to go alongside the public material I've been publishing for years now. This mostly consists of building a library of long form training commentary videos with some of the best trainers I've had the good fortune of training with in Thailand. The hope is that the people who pledge and support my work will not only will benefit from a different, in-depth sort of material, the documentary work will support itself and I'll be able to remain in Thailand documenting and fighting for the foreseeable future. The response has been very good, and it's close to becoming self-sustaining. You can read about that project and even become a supporter here: https://www.patreon.com/sylviemuay. All photos courtesy of Sylvie von Duuglas-Ittu. You can follow along with Sylvie on Instagram at @sylviemuay, on Twitter at @_ittu, and on Facebook by "liking" her page Sylvie von Duuglas-Ittu - Muay Thai. Please consider becoming a sponsor and help to support the blogs, videos, vlogs, and other wonderful content she produces! To purchase a sweatshirt, hoodie, or t-shirt to support, please click here.